Today marks 500 years since Martin Luther ignited the Protestant Reformation by nailing his 95 theses against the sale of indulgences to the door of the church in Wittenberg. 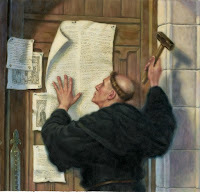 It was not his intention to start a convulsive movement; rather, he was hoping to foster a scholarly discussion on the topic he addressed in his 95 theses. However, thanks to the recent invention of the printing press the theses spread like wildfire throughout Europe. As well because printing became relatively inexpensive and easy, Bibles translated into the common languages of Europe flooded the continent. People could read the Bible in their own languages and preachers could preach the Word of God. The Reformation was built on the idea that salvation came through faith alone in Jesus Christ as proclaimed in scriptures and not at all through human endeavour. Luther had not expected the impact his actions would make. He described it like falling down the shaft of a tower and reaching out to grab hold of the bell rope to break his fall. That rope for him was the good news that we are saved by Christ alone, and it rang a gospel bell that woke up all of Germany and Europe. 5. so that all glory be to God alone. Thanks be to God and all praise to him alone that there are yet countless churches and pulpits where the true gospel is still proclaimed. At the same time we know that there are many places in the world, and even in our own countries, where the preaching is overshadowed by false doctrines and the candlestick is being removed. Let us on his Reformation Day, and always, remember the five solas.